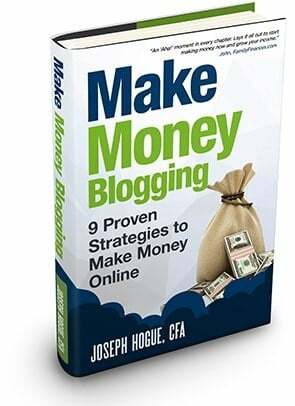 Blogging survey reveals how to make money blogging and all the biggest blogging questions. One of the hardest things about being a blogger is that you never know if you’re doing it right. Is your blog traffic growing as fast as it should? How much traffic do you need to make money? Are you making as much as you can or are you missing out on the best income sources? These are questions that bother all bloggers but because it’s such a new profession (yes, it is a profession! ), there are few sources for answers. You can ask another blogger how much they’re making or about their traffic. If you’re lucky enough to get an answer, how do you know if your blog is even comparable to theirs? I reached out to everyone in my contact list for the first annual 2018 Blogger Survey. The survey included ten questions from blog age, monthly visitors, monthly earnings, weekly time spent, posts published a week, monthly blog spending, rates for sponsored posts and freelancing and the income sources bloggers were using. I got just over 150 responses to the survey but am keeping it open so we can update this post every year. Add your blog to the survey here. What’s the Average Blog Look Like? 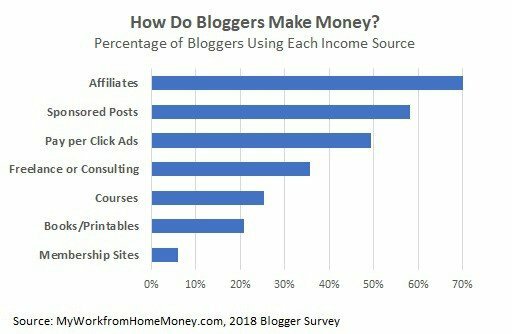 I know the question you want to ask first, “How much do bloggers make?” but let’s start by looking at the overall picture and the average blog. Sorry, I’ve got to go all statistics nerd on you for a moment. There is a difference between ‘average’ and ‘median’. The average is all the results divided by the number of results. The median is the middle number, the result at which half the respondents are below and half are above. The difference is important because averages don’t really show the truth in a lot of things. For example, a few blogs in the survey making $100k a month means the average is $5,966 a month. That’s not really a good estimate for how much bloggers make because of those few really high numbers. The median of $1,476 per month is much more realistic and gives you a better idea of how much bloggers make. So, I’ll be using the median for most of the results. The median blog is 36 months old and gets 13,200 visitors a month. The blogger spends roughly 14 hours a week, posting twice to the site. They make $1,476 a month, mostly from sponsored posts, pay-per-click advertising and affiliate sales. Now, let’s look at some of the cool stuff we learned in the blogger survey. This is the first question everyone wants to ask when you tell them you’re a blogger. Ok, it’s also the first question bloggers want to ask as well. Some of you are still trying to convince your mom that blogging is a real job. Next time she asks, show her this chart. 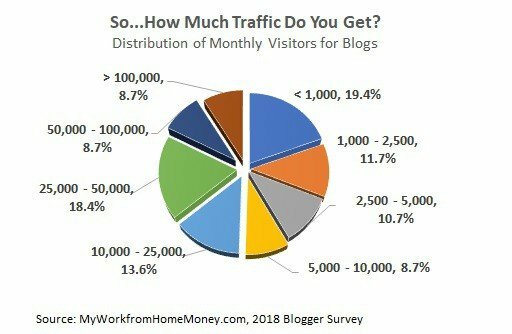 Nearly all the bloggers replied with their monthly income, ranging from making no money to two bloggers rocking it out making over $100k every month. Blogging isn’t easy money. Nearly four-in-ten bloggers make less than $500 a month. Only about a third (36%) make enough to consider it a full-time job, making over $3,000 a month. 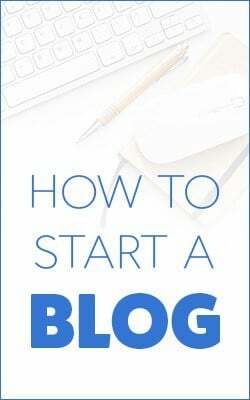 Once you find out you can make money blogging…you want to know how do bloggers get to the point of making thousands a month, right? What does the average blog that’s making $10,000 a month look like? Is your blog on the right track? Ask just about any blogger how to make more money and they’ll give you the same tired answer, work on building your traffic. They’re right that more traffic generally means more money but most blogs just don’t get that many visitors. In fact, we’ll see later that the bloggers making the real money have figured out how to make more on fewer visitors. Four-in-ten blogs (42%) get less than 5,000 visitors a month. Everyone wants to reach that mythical 100k visitor number, but the reality is that less than 10% of blogs reach that level on a monthly basis. And the blogs hitting those huge traffic numbers aren’t necessarily the ones making the most money. One of the biggest points of stress for many bloggers is whether their blog traffic is growing fast enough compared to other blogs. It’s frustrating to see other bloggers that started after you did zoom past you in monthly traffic. You’ve got to understand that there are going to be super-stars that see huge traffic growth. That doesn’t mean you’re doing anything wrong or even that you’re falling behind the average blog. This chart shows blog traffic by site age in months. There are some high-flyers that don’t show on the graph because I changed the axes scales to show more detail. The trendline shows where blogs tend to be with monthly traffic for each year. Remember, these numbers are based on the average so will be skewed higher than the median blog traffic. 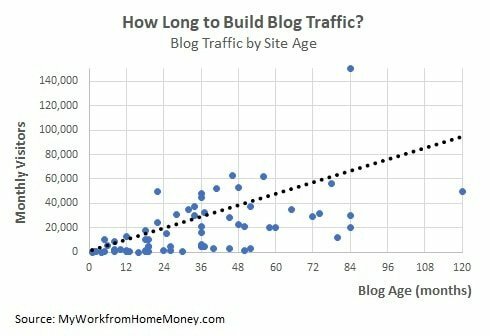 The relationship between age and blog traffic isn’t perfect. More than half the bloggers (53%) see less than 20,000 visitors a month no matter how old their blog. Even that doesn’t tell the whole story though. If your goal is to reach as many people as possible, then traffic is an important measure to follow. If your goal is to make money (don’t hate, we all gotta pay the bills) then you should focus more on how much you’re able to make on whatever traffic you generate. 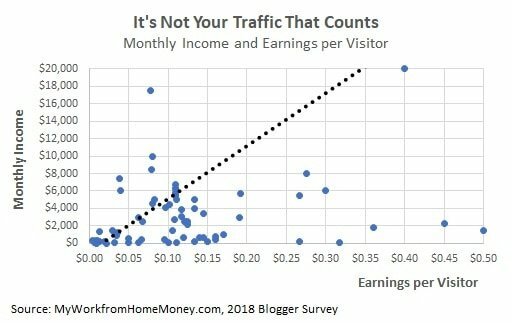 This next chart shows how much bloggers are earning per visitor and total monthly income. Again, I changed the axes to show more detail where most bloggers are but there were responses from bloggers making more than $0.50 per visitor and more than $20k per month. I thought this chart was interesting because the responses weren’t scattered all over the place. There does seem to be a relationship. If you want to make more money, focus on making more per visitor rather than just building more traffic. This was the most interesting part of the survey for me. 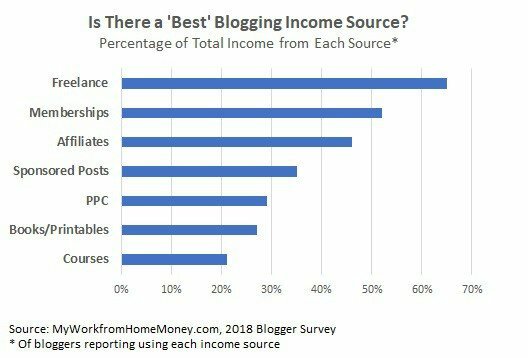 I asked bloggers which income sources they were using and how much of their total income they booked from each source. Nearly everyone uses affiliates, no surprise there. Affiliates generally pay better than pay-per-click advertising and you have more control over what is advertised on your blog. Affiliates are also faster to implement compared to offering a course or self-publishing since you don’t need to develop your own product. Sponsored posts are still a popular source of income. Bloggers reported charging between $15 and $5,000 for a sponsored post with the median at $188 for a post. For those bloggers that reported charging less than $25 for a sponsored post, PLEASE STOP! You aren’t charging what it’s worth and the quality of post is probably hurting your blog. Bloggers also reported charging between $25 and $300 an hour for freelancing and other services with the median at $75 per hour. I also asked bloggers what percentage of their income they make off each income stream they use on their blog. This chart shows the percentage of income bloggers report making from each source, if they use that source of income. The chart surprised me. I would have guessed that, of the bloggers selling courses, it would have been a much bigger chunk of their total income. 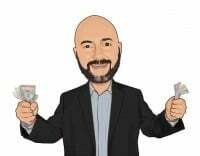 After all, courses sell for hundreds and all that money goes to the blogger versus making a few bucks on each printable or commissions on affiliate sales. Freelance is where the money is at for most bloggers. Charging $100 an hour means a six-figure income on less than 20 hours a week if you can keep your schedule filled. For the few bloggers that do membership sites, they seem to do very well and book half their total income from recurring member fees. Running a membership site means on-going work and the constant need to provide more value but it does seem to be a great income source. Something to think about. It was interesting to look at the number of income sources compared to total monthly income. Bloggers making less than $500 a month were using an average of two income sources. Those making more than $1,000 a month reported using three income sources on average. Bloggers making over $5000 tended to use more sponsored, courses and affiliates compared to the group making less than $1,000 a month. 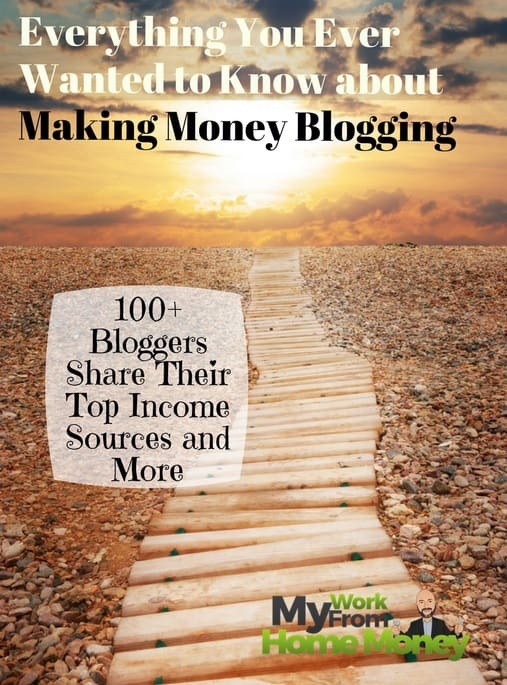 You can’t rely on just one income source as a blogger. Changes to Google search rankings affect your advertising and affiliate sales. Affiliates can change their payout rates or drop the program altogether. Changes and competition within Amazon can affect book sales. Sponsored posts can ultimately get you penalized by Google for too many dofollow links to spammy sites. Trading time for money with freelancing or consulting limits your time and the amount you can make. You may dream of a six-figure blog but making money doesn’t come cheap. Like any business, there are expenses to running a website. 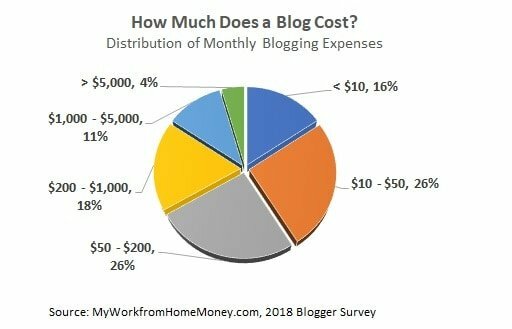 I asked bloggers how much time they spent each week and how much it cost to run their blog each month; including hosting, support, marketing and all other costs. The median blogger spends $100 a month to maintain their site though four-in-ten (42%) spend less than $50 a month. The most anyone reported spending was $30,000 a month with only a small percentage spending more than $5,000 a month. But we all know that it’s not the money you put into your blog but the time. Bloggers reported spending a median of 14 hours a week on their blog with one-in-ten spending more than 30 hours a week. Most bloggers published one or two posts per week with about 10% of the blogs posting more than five times a week. Did the blogging survey answer every question I’ve ever had about blogging…no, but it did help to clear up a few of the ones that I stress about constantly. I hope it answered many of your blogging conundrums. We’ll do this survey post every year so feel free to suggest new questions. Blogging is a real thing! 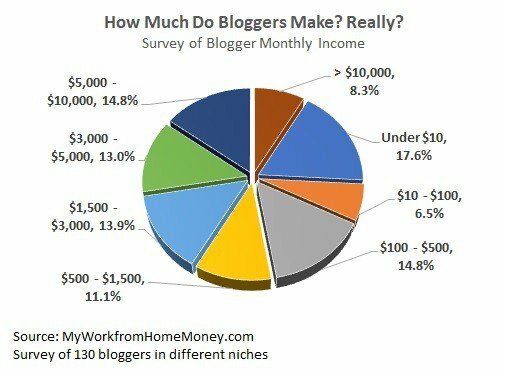 More than one-in-five bloggers (23%) make over $5,000 a month. The median blog is just 36 months old but reaches 13,200 people and makes almost $1,500 a month. On just 14 hours a week, that amounts to roughly $24 an hour for blogging. Half of all blogs (50.5%) get less than 10,000 visitors a month so don’t feel like you need huge waves of traffic to make money. The median blogger makes about $0.11 per monthly visitor but that number goes as high as several dollars per visitor. The way to make more money is to increase your revenue sources, not by focusing solely on traffic. Blogging is pretty amazing. What other job can you start with almost no money and with no educational barriers and see your income grow so quickly? What other job allows you to reach tens of thousands of people a month while doubling your income every year? The first blogs were created just 20 years ago and there are still a lot of questions. Learn as much as you can about the business of blogging and YOU WILL make money. Don’t stress too much about whether your traffic is growing fast enough or how your blog compares to others. Stick with it and you’ll be a successful blogger in no time! Great stats! Thanks for including my research within your report / survey. Thanks for your input Zac. Great seeing what other bloggers are doing and not stressing out over how to make money or if my blog traffic is ‘average’. Thank you for including us in you survey Joseph, it’s great to see how we re doing as a blogger community! Keep up the great work, this article is info-packed! Thanks Warren. Great view into the business of blogging and I think it will help a lot of bloggers stick with it knowing they’re not behind the curve. Thanks again for contributing. Amazingly informative article! It’s great to see what’s “normal” to be able to put into perspective of what we see on all the blogs about blogging. You have visitors by age and income per visitor, but I’d be interested to see the blog income by age of blog. With that information, we can really look at our total visitors and total income and start to see how ours business is progressing. Thanks Eric. Reading through the post, there were some more info I’d like to see (income by age of blog was one of them). Will have to make sure I hit it in the update next year. Thanks again for contributing. Really fun data Joe – thanks so much for putting this together! It is always great to peel back the curtain and see how other bloggers are doing compared to yourself. Thanks Derek. Some great info and really enjoyed putting it together. Thanks for contributing. Thank you, I really enjoyed this article. I’ve been blogging just for fun, but you have convinced me to at least try using affiliates. Thanks again for all the great information! Thanks Bonnie. 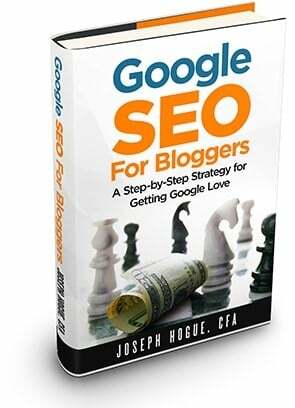 Affiliates can be a great source of blogging income, especially for certain niches. Let me know how it turns out! Hey Joe, thanks for the post! Really interesting to see the stats. I’m curious if there was any correlation in your responses between number of hours spent per week and income per month? Another stat I would be interested in seeing is median income by topic/category of blog content. Great questions. The median income by blog niche is definitely one I’d like to add. I didn’t ask for blog topic in the survey but will have to add that soon. Glad you liked the stats. Thanks.